The panel was hosted by the editor of a popular art blogazine Hyperallergic, Hrag Vartanian, who as Peter Hopkins from The Bogart Salon pointed out “is no cheerleader of Bushwick, he’s rather a cricital observer.” Other panelists were Deborah Brown, artist and owner of Storefront Bushwick gallery; Thomas Burr Dodd, artist, owner and founder of Brooklyn Fire Proof; Carolina A. Miranda, art critic and culture writer for WNYC and Artnews; and Marco Antonini, Director of NURTUREart. The panel discussion was very interesting and many resonating issues were raised by the panelists. It is also noteworthy that a parallel lively Twitter discussion was going on. The Twitter talk included the editor of Art Fag City, Paddy Johnson, New Criterion managing editor, James Panero, artist William Powhida, Stephen Truax from BushwickBk, and others. We were monitoring the debates both online and offline, and we are bringing you the most interesting points made through out the night. How was your arrival to Bushwick? Carolina, whose big article about Bushwick is coming up in Artnews next week, spent 7 years in the neighborhood. She said that when she arrived, the only way to make connection with other artists was to spot someone with weird hair in a deli. She pointed out that art is an industry. 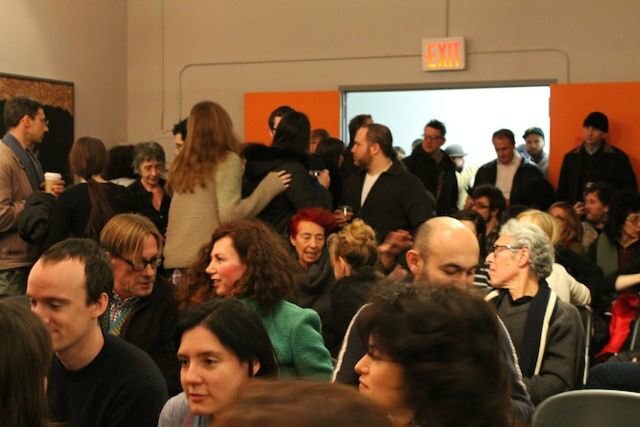 While in 1968 there were 72 MFA programs in the country, today there is over 900… She said that Bushwick is actually the place where the entry level workers of art industry come to live. With the artists, the businesses come, which should be a good thing for the neighborhood, but often new businesses don't hire locally, which creates tension. Carolina thinks that for people who came to Bushwick before the Blackout, its development is a good thing. They are welcoming a safer environment, new opportunities, etc. For people who came after the Blackout, it’s not so good. She said that whenever the locals see another U-Haul truck, they roll their eyes, because another Blanquito is coming, and the price of their rent, even the chicken in a bodega will go up. Thomas, who runs Brooklyn Fire proof, rents 185,000 sq feet of property in Bushwick. He has been in the neighborhood for 9 years, and originally opened BK Fireproof as an art gallery in Williamsburg. He used to come to Bushwick to party. He said that there are many people around who don’t want to see Bushwick progress, because what many of us don’t know, Bushwick serves to Manhattan. For example most of the garbage from Manhattan ends in Bushwick. There are people who don’t want this to change its industrial function. Deborah Brown came in 2006 for the first time by accident, and 3 weeks later she owned a factory at Stockholm Street. Her intuition told her that Bushwick will be happening soon. Deborah said that she had witnessed big changes throughout the years, but the biggest changes have occurred within the last 6 months. Deborah thinks that 56 Bogart building is a manifestation of the art community, and that you can do anything in Bushwick. She co-founded a gallery, and is a member of the Community Board. Also, at the Community Board you get a completely different outlook on Bushwick; you get to learn who the leaders of the community are, you meet families, etc. Deborah said that she has heard virtually nothing on the Community Board about the art community for years, and she has been the only one there and on her block, of her race and age...except for the last 6 months. Hers was a voice expressing anxiety and fear of the change. She said that it was the number of people coming recently to this neighborhood that triggered this anxiety. Deborah said that the demographic composition of Bushwick is a lot more complicated that people think. There are many people of Latin descendant, but also many undocumented new immigrants. Marco Antonini has never lived in Bushwick. Ironically when NURTUREart moved to Bushwick recently, he wanted to move here too to be closer to work, but he couldn’t find a place that he could afford. He lives in Clinton Hill. He said that arts have always been a major factor of gentrification, and you can’t stop city from expanding. He, as the only European on the panel, said that what is being referred to as “community” is simply a class that differs by education, race and wealth. Infrastructure in Bushwick. Will the L train kill us? Hrag makes a point that many galleries that moved from Williamsburg back to Manhattan did so because of the L train and its frequent repairs. The question is how much the L train influences Bushwick. We saw during Bushwick Open Studios 2011 when the L train was not running, that its impact could be significant. Other panelists seemed to agree with Hrag, and everyone was wondering what the hell MTA is always repairing there. “They could have had another tube by now,” Thomas said. The first galleries in Bushwick didn’t have a commercial agenda at the top of their priority list. 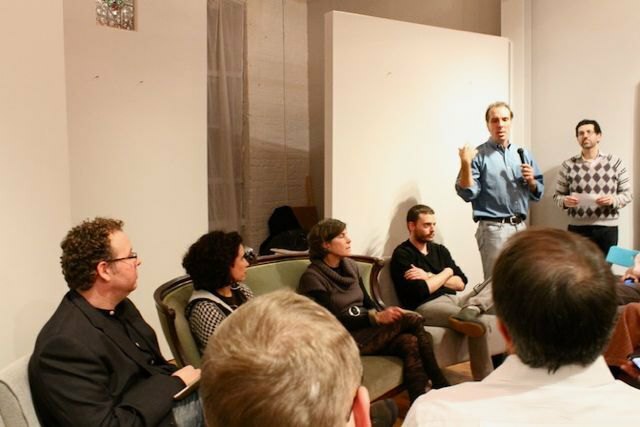 How will the arrival of art business influence Bushwick? Deborah said that there are new galleries arriving in Bushwick that certainly want to do business. Like Stephanie Theodor, a gallery that is about to open at 56 Bogart. Carolina thinks that Bushwick is a little in love with itself, because apartment art shows are something that has always happened in the beginning of a scene. However, this commercial wave can have a “parachute effect,” meaning that the art collectors from Luhring Augustine will go to the gallery, eat at Roberta’s afterwards and go back to Manhattan. @cmonstah says Bushwick changing at hyperspeed and is becoming the art industry, not a scene. Hrag points out that this scene is more self-conscious. Marco makes an interesting point that the critical mass in Bushwick is very self-sufficient, DYI. He sees the future in smaller commercial ventures. He thinks Bushwick has a pragmatic scene that will make sure to survive. Hrag points out that this self-sufficiency might be also caused by the cuts in funding of arts, and that the artists had to learn how to be self-sufficient. Thomas says that he sees a trend in Bushwick where the most of the artists realize that they probably won’t become world’s most famous painters. Instead they become mini-manufacturers with 1 or 2 employees creating their product, living a creative life. He says that every closed door in Bushwick is hiding something exciting happening. He sees a very entrepreneurial spirit in Bushwick. Are we getting support as a community? Marco thinks we definitely are not, but that’s a problem with funding for arts everywhere in the world. However, it’s not automatic in other countries that artists have this entrepreneurial spirit, and that’s why the lack of support is sad. Deborah thinks that because we vote, we can influence the allocation of funds. Also there are huge poverty issues going on in Bushwick outside of the art world, that are more urgent and require attention. Thomas expresses his frustration with the city. His businesses are always getting huge, unreasonable fines from inspectors. (“A fruit fly, $300.”) He says that the inspectors are squeezing money out of little businesses, and taxes are being raised even during the worst recession.